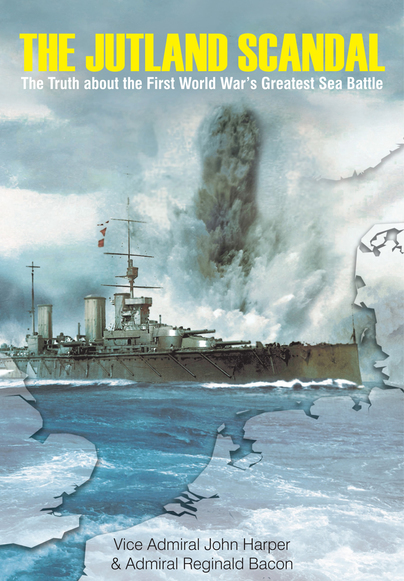 You'll be £25.00 closer to your next £10.00 credit when you purchase The Jutland Scandal. What's this? Order within the next 6 hours, 22 minutes to get your order processed the next working day! The Royal Navy had ruled the sea unchallenged for 100 years since Nelson triumphed at Trafalgar. Yet when the Grand Fleet faced the German High Seas Fleet across the grey waters of the North Sea near Jutland the British battleships and cruisers were battered into a draw, losing far more men and ships than the enemy. The Grand Fleet far outnumbered and outgunned the German fleet so something clearly had gone wrong. The public waited for the official histories of the battle to be released to learn the truth, but month after month went by with the Admiralty promising, but failing, to publish an account of Jutland. Questions were raised in Parliament (twenty-two times) yet still no official report was produced, due to objections from Admiral Beatty. This led to Admiral Bacon producing his own account of the battle, called The Jutland Scandal in 1925. Two years later the man instructed to write the official report, Rear-Admiral Harper, decided to publish his account independently, under the title The Truth About Jutland. Worth reading as an antidote to pro-Beatty hagiography. A fresh presentation of two books first published in the 1920s. Vice Admiral Harper wrote his personal account after his Admiralty-approved analysis was suppressed; Admiral Bacon wrote his after various London newspapers and Winston Churchill has sided with Beatty. Both accounts include useful maps to illustrate the tactical questions that arose. This volume is for the specialist wishing to read more deeply into the battle. These two accounts give important insights into the battle. Bacon's analysis includes very useful diagrams that explain the subtle dynamics of fleet action. Harper's contains some incisive comments. ... Together, these two books provide an excellent primer about the battlefleet tactics in the context of the seamanship and communications of the period while at the same time giving insight into the Jutland controversy that threatened to engulf the Royal Navy in the 1920's. Highly recommended despite problems with three of the illustrations used in this interesting volume. ... These are important books, now combined in one volume, and essential to a balanced overall study of Jutland and the Royal Navy in the First World War. At the time of publication the authors wrote for an audience familiar with Jutland and its aftermath. Contemporary readers should recognise this and may find a good ‘introductory’ text such as the abovementioned ‘Jutland; The Unfinished Battle’ useful. Produced as one volume for the very first time, the book tells both Admiral Bacon's and Admiral Harper's accounts of the Battle of Jutland. They reveal the failings of senior officers and the distortions of the early historians and tell the truth about the biggest scandal that developed following the largest battle ever fought at sea. Understandably, the writing style is a century old and distinctly British, but it remains both readable and understandable. An essential book that details the decisions made before during Jutland and very recommended to those who wish to establish a complete appreciation of the last major engagement between opposing battle fleets. Reginald Hugh Spencer Bacon, from Wiggonholt in West Sussex, joined the Royal Navy in 1877, at the age of just fourteen or fifteen. He passed away in 1947. John Ernest Troyte Harper was born in New Zealand on 29 May 1874, joining the Royal Navy in 1888. He died in 1949.